Pope Francis formally changed the official Catholic Church teaching in calling for a world "free of the death penalty." 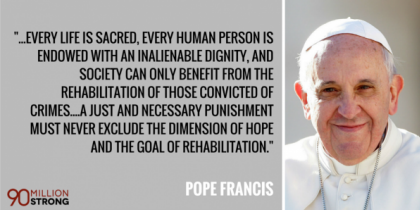 In a statement to the sixth World Congress Against Capital Punishment, the Pope asserted the death penalty "is an offence to the inviolability of life and to the dignity of the human person." "It likewise contradicts God's plan for individuals and society and His merciful justice." He noted that the commandment "Thou shalt not kill" applies "both for the innocent and to the guilty." He reported that Catholics have designated 2018 as the "Holy Year of Mercy," in which he hoped that Catholic leaders would "make a courageous and exemplary gesture by seeking a moratorium on executions." What's particularly important is that Pope Francis has revised the Catholic Church's Catechism, the church's official teaching, on the death penalty - from permitting it in very rare circumstances, to now deeming it "completely inadmissible" and violative of the "dignity of the person." He said the state "should be oriented above all to the rehabilitation and social reintegration of the criminal." His position reflected and reinforced a stunning decline of capital punishment worldwide in recent decades. In 1970, fewer than 20 nations were fully abolitionist. Today, more than two-thirds of the world's 200 countries have abolished the death penalty! All of Europe has taken this stand, and all but two in the Western Hemisphere - the United States. and St. Kitts! As a practical matter, most executions are confined to a handful of countries. Five countries - China, Iraq, Iran, Saudi Arabia and Pakistan - carried out well over 90% of last year's executions. The Pope's initiative is important news. In the United States, the number of executions has plunged from 98 in 1999 to only 14 last year. The number of states which abolished the death penalty increased from 31 in 2000 to 38, and several more appear to be on the cusp. Vatican expert John Thavis said Pope Francis's action "will be a big deal for the future of the death penalty in the world. People who work with prisoners on death row will be thrilled, and I think this will become a banner social justice issue for the church." I asked Robert Dunham, who directs America's Death Penalty Information Center - what impact he thought the Pope's new opposition to government executions would have. "It is likely to have an effect in real politics. Already we are seeing some of the pro-death penalty Catholic elected officials and prosecutors - acting defensively. There are several states that are close to abolishing the death penalty: Washington, New Hampshire, Utah and Louisiana. "In New Hampshire, the legislature voted to abolish the death penalty, but Gov. Chris Sununu vetoed the bill. The change by a handful of votes by Catholic legislators would be enough to override the governor," Dunham asserted. He added that in Washington State, abolition is supported by its governor and the attorney general. A repeal bill passed the state senate, and by the House Judiciary Committee. But it was not voted upon by Washington's House before the session ended. "The Speaker of the House who did not bring it up for a vote - is a Catholic, as are several House members who were wavering on the issue." "The Pope, in stating that the Catholic Church is committed to its abolition - may provide the legislators with the courage to do what they want to do. In Louisiana the Catholic Church has been active in trying to repeal the death penalty, and the Catholic governor and is involved in an on-going fight with the Catholic Attorney General. The death penalty is not simply a Catholic issue. Jurors in Washington State are three times more likely to recommend a death sentence for a black defendant than for a white one. Similarly in California, those convicted of killing whites were more than three times as likely to be sentenced to the death penalty as those convicted of killing blacks. Also, since 1973, more than 162 people have been released from death row with evidence of their innocence. Death row inmates are overwhelmingly concentrated in a few states: 746 in California, 374 in Florida, 243 in Texas, 191 in Alabama, for example. Do the states with executions have lower crime rates? NO. The South had the highest murder rate, even though the South accounts for 80% of executions. The murder rate of states in the Northeast is 3.5 per 100,000 residents compared to a 6.5 rate per 100,000 in the South. Let's end the death penalty in America!